Eric Dose and I attended the 2011 Society of Astronomical Sciences conference at the Northwoods Resort in Big Bear, CA May 24 through May 26. On the 24th we had workshops on Observatory Automation and on Eclipsing Binary Star analysis. The two days of paper presentations covered a myriad of astronomical topics, mostly geared toward the amateur. Eric flew, but Jane and I drove, a little over 3000 miles round trip, with 4 nights on the road. Jane is always in a hurry to get home after a trip, so that was 3 nights to get there, then a lot of driving to get home with only one motel night to get home. I Plan on summarizing some of the material in the upcoming weeks. Perhaps Eric will join in and also provide some comments. Though not actually part of the conference, there were two significant developments. We have been bemoaning the lack of ASCOM compatibility with the Tombaugh. ASCOM is a generalized interface to many devices and software packages related to astronomy. Jerry Foote, builder of the Tombaugh, now has ASCOM drivers for his software and will ship them to me next month. We hope this will help in our efforts to automate the Tombaugh Telescope. – oops again, a 10% discount, up to $500 on a QSI CCD camera. So, if 9 of you want to match the $500 in some fashion, we can get a $5000 CCD camera, in which case I share the wine. Otherwise I enjoy the wine alone. I finally got around to running a few trials of the latency test with the STL1001E CCD camera as described in MaximDL CCD software. 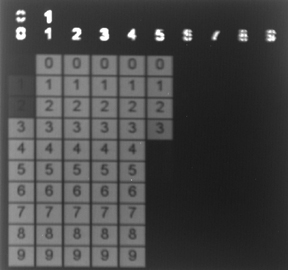 The result shows the delay from the time the computer tells the camera to open to when the CCD actually starts to register an image. Surprisingly the delays ranged from 0.02 seconds to 0.09 seconds in 25 trials. The most common delay was 0.03 seconds. An average of 0.04 seconds is the delay that I ended up adding to the time in the fits register. So every image I take will now include this very minor adjustment to the U.T. start time. The folks at SBIG did a really great job with their shutter system. I have stiffened the gable and the mounting for the new roll-off roof drive at Sandlot and gained a lot of reliability & performance in the drive system. 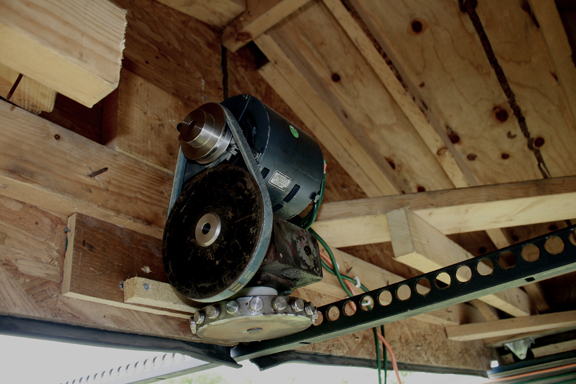 Now the roof rolls off in less than 45 seconds (about 13′ of movement); and also closing in 45 seconds. Apply this same rate to Farpoints 33′ of movement needed to fully open or close the roof, the roof movement should take about 2 & 1/2 times as long (just under 2 minutes each way). The unit is still not as smooth as I would have hoped but I now know how to accomplish that. The shape of the hub prongs need to be spherical instead of just 1 dimensionally round. I’m encouraged my 1/6th HP motor seems to work OK but maybe just a bit underpowered. If and when we switch over Farpoint’s cable system to this hub style drive I’m estimating a 1/2 HP motor will be needed. But maybe at the next board meeting we should discuss proceeding with Farpoint’s roof drive conversion. Alternatively, with an in pouring of copious of amounts grant money (somewhere around 25 to 30K dollars) we can convert to a dome which, I believe, would nearly double the amount of time the Tombaugh is usable for imaging via increased wind protection. A dome would also provide greater security especially if we would operate the system via the web. The dome can be slaved to the telescope operation so that where ever the telescope is pointed the dome drive will move the slit to accommodate. I really don’t want to go through work and expense of changing the roof drive we currently have and then latter remove it in favor of a dome..